Back when I used to pretend to be cool (a ten-minute period back in 1997), I couldn’t imagine anything more embarrassing than using a guidebook while travelling. If I’m honest, I still refuse to pull out guidebooks in public places and prefer to consult my maps in out of the way places where no local will dare offer to help me find my way. Presumably this stems from the belief that if I don’t do these obviously touristy things, I will be mistaken for a local. This has never worked outside of a select group of countries (the joy I feel when presented with a completely incomprehensible menu in Dutch or Czech is immense) but I persist in thinking it will. But I am wandering off topic. My point is that, while preferring to use them covertly, I love my travel guidebooks. I study them religiously before going on trips, memorize the city maps they contain and any suggested travel itineraries, and, as a result, have a marvellous, stress-free time once I arrive at my destination, well-prepared to embark on my adventures. And, though no guidebook is perfect or comprehends everything that you want to know, Rick Steves’ books are my favourites when it comes to planning my European holidays. After years of reading his books and watching his travel shows on PBS, I knew much about Steves’ philosophies (for example, his passion for Travel as a Political Act) but very little about his background. 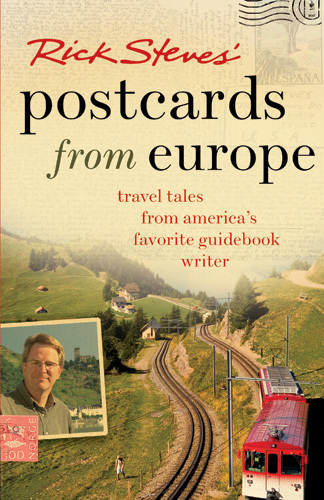 So, when I heard about Postcards from Europe by Rick Steves, first published in 1999, I picked it up eagerly. The book follows Steves as he makes his way across Europe, meeting up with old friends, rediscovering favourite places, and marvelling about his luck at turning a love of travel into a full-time job. 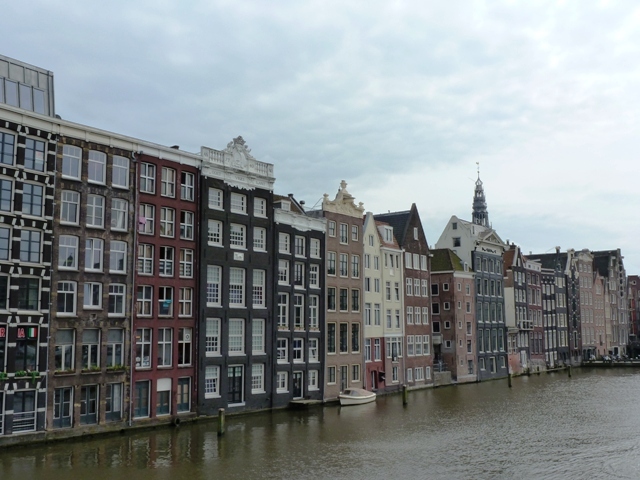 Through the Netherlands, Germany, Switzerland, Italy, and France, he relates stories from his many years as a travel guide and from his own early adventures in Europe, first on a staid but eye-opening family holiday and then on the “Europe Through the Gutter” he and a friend took after graduating from high school. It is a nostalgic journey, as Steves examines how he has changed over the years and what his influence has been on changing some of the places and people mentioned in his guidebooks. For me, the best part of the book was learning more about Steves’ past. How he came to love Europe and how he basically fell into the travel industry by giving talks (which turned into classes) to raise money for his upcoming European holidays. The early years of the tour group business sound a little sketchy (stays in hostels and tents, rides on the top of the coach bus, torrid love affairs among clients, guides, and bus drivers, etc) – a particularly funny juxtaposition if you’ve ever come across a modern-day organized Rick Steves tour while travelling (average age seems to be mid-sixties, though that might be generous). But maybe I am being overly censorious; perhaps the seniors are getting up to equally remarkable (and legally questionable) high jinks today. I rather hope so, especially since they are of an age to have been some of Steves’ original clients back when he started conducting tours. Every so often, there was an anecdote or joke that took me completely aback. There was nothing crude or offensive, just a little racier or saltier than my PBS-sanitized mental image of Steves. These were memorable stories (a young mid-Westerner’s encounter with a particularly enterprising female thief in Rome stands out in my mind) but left me shamefully embarrassed – for myself, not Steves. It’s that same sort of shock as when you first hear your parents make a dirty joke. It takes a while to recover and to realign your universe. As usual, Steves make me long to go to the places he talks about in the book. 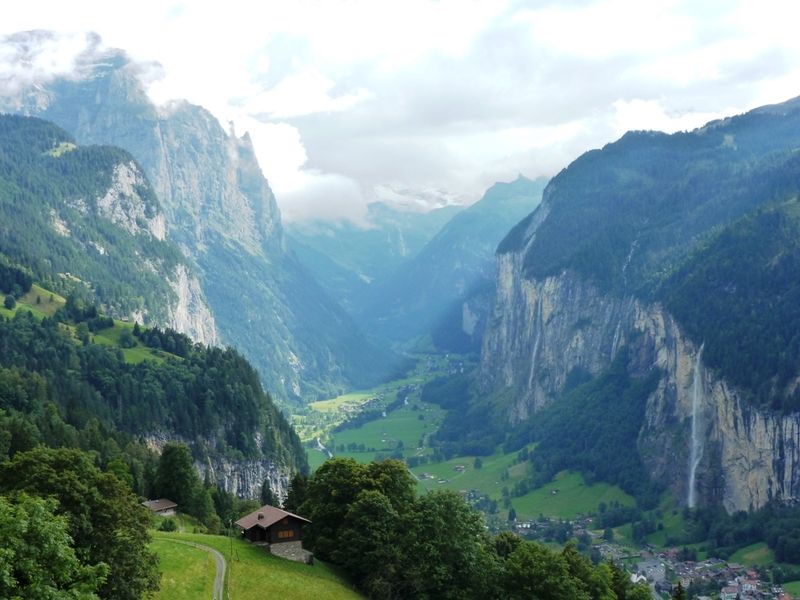 Most are old favourites – the Netherlands, the Rhine Valley, Munich, the Lauterbrunnen Valley in Switzerland, and, of course, Paris – but others I still long to visit. His enthusiasm for Venice is infectious – even if I hadn’t already been longing to go, I’m sure reading this would have sent me running to the library for more books on that watery city. Most of all, I appreciate how liberal he is with jokes about national stereotypes. If there is one thing I love, it is sweeping generalizations about the characteristics of nations (think Letters from England or Switzerland for Beginners). There are many particularly good zingers about Americans here (Steves is, after all, on a quest to broaden the minds of his fellow countrymen), one of my favourites being: “Babies, ancient astronomers, and Americans think the universe revolves around them.” But there is one joke, supposedly told to Steves by some Dutch friends, that I have joyously shared with all my friends and family and which comes at the expense of us otherwise adorable and inoffensive Canadians: “Canada could have had it all: British culture, French cuisine, American know-how…but they messed up and got British food, French know-how, and American culture.” We are working hard on righting this, but how true! Reading this was like, after years of admiring but never really knowing someone on the edge of your circle of friends, finally sitting down with them for a few hours and learning their life’s story. It was an informative, fun, and more than a little surprising experience that, in this case, left me even fonder of Steves than I was before. I love Rick Steves! My husband and I pretend to watch ironically, but it’s actually great. I can’t picture him telling a dirty joke or even swearing. Lovely review! I love Rick Steves! I still have the suitcase/backpack I bought at his shop in Edmonds WA before one of my trips to Europe. on December 10, 2014 at 03:55 | Reply Wordy. Another amusing/interesting piece, Claire. Whether I read anything of Rick Steve’s is debatable but your musings about the books you read never fails to amaze and entertain this ageing Brit. Seasons Greetings and all that. I love Rick Steves. This sounds like a great book! I have yet to use any of his guidebooks on a trip. I purchased one for Poland but the country was, unfortunately, dropped from my itinerary. I understand what you mean by some of his jokes taking you aback, though. Rick Steves’ television show is aired right about the time I get home from work so I often put it on in the background while I made dinner. One of the more recent episodes followed him to Germany and there was just something about this behavior and jokes in that episode that seemed saltier than I normally expect of him. I don’t know if you’re aware of Bill Bryson’s ‘Notes from a Small Island’ or Kate Fox’s ‘Watching the English’ – they’re not so much sweeping generalisations as acute observations of all our foibles, but still very funny. I’m a big fan of all Bill Bryson’s books. For some reason, I’ve never really warmed to Watching the English.